Oh wedding industry, how I came to loathe thee. I think the worst part is the ways that it manifested in my friends. 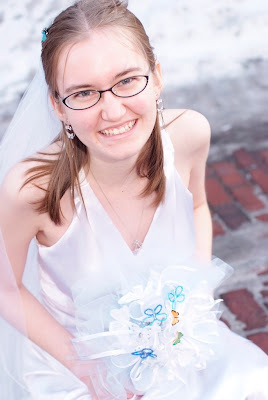 When I began to plan my December 2010 wedding, two of the things that I knew immediately about what I wanted to wear were that I didn't want to wear make-up and that I didn't want to wear high heels. I thought I had pretty reasonable reasons for this too. I didn't want to wear make-up because I didn't wear it every day and I wanted to be real for my wedding. I didn't want to wear high heels because I don't wear high heels that often and I knew that wearing them all day would make my feet hurt. I wanted to be comfortable. I ended up telling this to one of my friends, who asked about it, and another one of my friends who was walking by who stopped to say hi. Let's call them A and L. L was adamant that I had to wear make-up and high heels for my wedding. I argued with them for about half an hour, saying things like it was my wedding and I wanted to look like myself and that my husband prefers me without make-up (which they didn't believe). I ended up walking away from that conversation when A asked me, "Well what's the point of getting married if you don't want to be a flawless, perfect, airbrushed bride?" The sad thing is, A was completely serious. I responded back, "Because I love him!" I think this was when it hit me how much the wedding industry has infiltrated ordinary people, that they think this is the purpose for a wedding. I couldn't believe it, especially since L was in a women's studies class with me where we talked about these issues on a regular basis. I think the way I coped was to stop sharing details. I didn't want to tell people if I was only going to get criticized. I didn't let them change my mind and when we got married, you better believe that I dressed exactly how I wanted to, make-up free and in flats (well, boots part of the time by virtue of having a winter wedding in Wisconsin). That's why I'm proud to share that picture up there with you. I know that I look beautiful and I know that I felt comfortable too. Do it your way. I want you to feel comfortable. It's your wedding. Melissa is an almost-graduated college student double majoring in Writing and Political Science. She has a part-time job in a library. When she's not working or studying, she enjoys playing Mario Kart against her husband and blogging at www.womeneverywhere.wordpress.com. Nick is eventually going to go back to school for software engineering, but is a stay at home husband right now. He spends his extra time watching lacrosse and playing video games. Being from Canada, Nick met Melissa when he came back to stay over Thanksgiving holidays with one of her best friends from high school who was his roommate. They struck up a long distance relationship which ended when they got married on December 28th, 2010. A huge thank you to Melissa for sharing her story with 2000 Dollar Wedding kindred spirits! If you have an idea for a guest post you would like to write, please send me an e-mail! I love this post! I agree so so so much. Why would you want to be something totally NOT you, on your wedding day? I just don't get it. I wore flip flops and brushed my hair on my wedding day. I wanted to look like myself, like the person my husband loves, not a puffed up, made up, unrealistic version of me. Yes! My sister also insisted that I wear high heels to my wedding, and mostly, it's just impractical. I almost never wear heels and no I'm supposed to wear them on a day where I will be standing for like 7 hours straight? Not happening. This is one of the best wedding posts I've read. You DO look beautiful! You look happy because you're marrying the man you love! And that's what it's all REALLY about. I know we don't need (or want!) most of the things the wedding industry had trained us to desire... But sometimes friends and relatives have a way of guilting us to conform... So this was a great reminder to stay strong and be ourselves! I think so many women get so caught up in trying to look their absolute best on their wedding day. Looking your best, doesn't mean you're going to look perfect. There is no such thing as being perfect! AMEN! lol. I never wear makeup and am tired of people telling me I "should" "need to for your wedding" or "have to." I am so glad you stuck to your guns. As much as I liked the article, I have a hard time hearing feminist arguments from a very conservative pro-life and religious blogger with an extremely radical stance on women's reproductive rights. Obviously, I support women everywhere who love their bodies and try to promote authenticity but I just wanted to point that out. @Anne - I think that is very mean and judgmental for you to say. I would have to respectfully disagree with you. P.S. - Melissa, you look beautiful!